Today I will introduce about "HINOKI"
Btw.. do you know hinoki?? Hinoki is a conifer of the Japanese cypress genus that is found only in Japan and Taiwan. It is well known that Japanese cypress HINOKI is an ideal material for such as palace construction for a long period of time. Cypress wood is the world's highest level of durability and preservation. It's possible to use a HINOKI for an construction material more than 1,000 years. The origin of the name of Hinoki is said to be "Sun Tree" which is precious and represents the best of all other number wood. It smells elegant and soothing. The scent of HINOKI is highly relaxing and brings about the same effect as forest bathing. Because it smells elegant and relaxing, it is popular in Japan that it is used such as luxurious inn rooms and luxurious spa bathtubs. 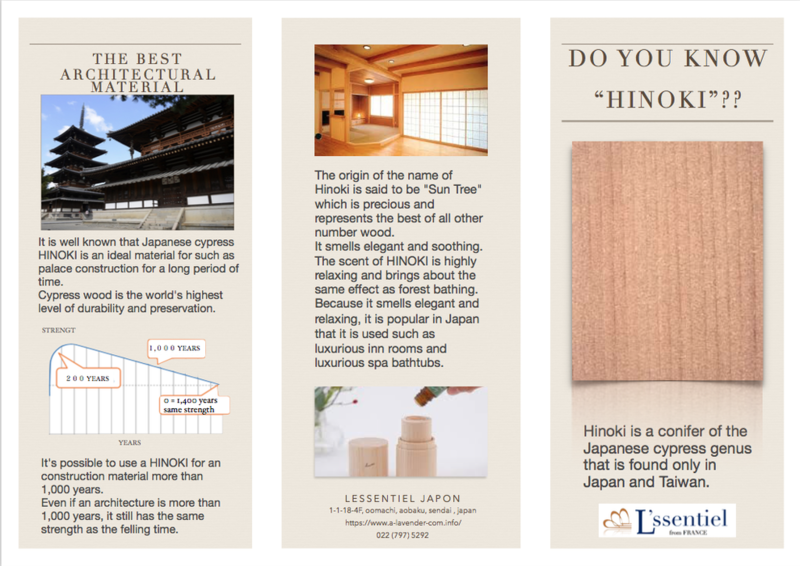 Why don't you enjoy the scent of HINOKI?? Please let me know if you have some question about essential oil of HINOKI .